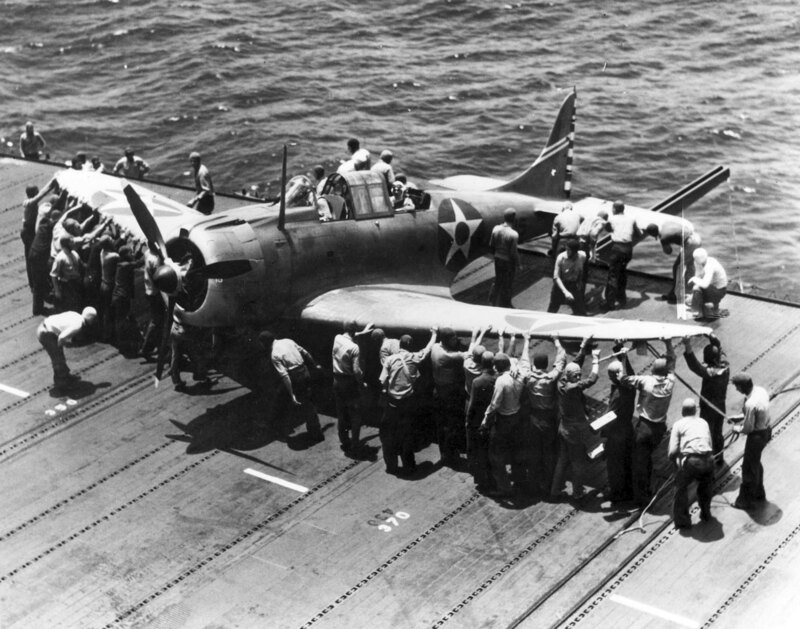 Personnel of the aircraft carrier Enterprise (CV-6) places the Douglas SBD Dauntless dive bomber from the VB-6 bomber squadron on the edge of the flight deck. This is done to accommodate more aircraft on the flight deck. This Douglas SBD Dauntless will later take part in the Battle of Midway at the command of Ensign George H. Goldsmith. When attacking the Japanese aircraft carrier “Kaga”, the diver will be damaged and the pilot will be forced to sit on the aircraft carrier Yorktown, producing fuel. Later, the aircraft will die with the Yorktown aircraft carrier.